Until recently, ballroom dancing often brought about mental images of elderly couples dancing two inches from their walkers. However, in recent years, ballroom dancing has developed a new, hipper, sexier image and people of all ages are standing up and paying attention. 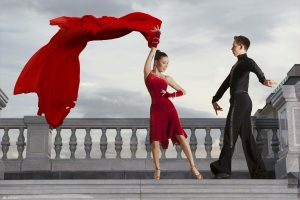 Movies such as Strictly Ballroom and Shall We Dance have contributed greatly to the newer kinder image that ballroom dancing is developing in the United States. As an art form, ballroom dance is a beautiful sight to behold. Particularly when watching those participate on a competitive level. Because of the rigorous training that is involved in competitive ballroom dancing, many couples that participate often consider this to be a sport more than a style of dance or manner of artistic expression. The term DanceSport is often used in reference to ballroom dancing in the International Style. There are many styles of dance that fall under the banner of ballroom dancing. Some of these dances are often considered to be the most beautiful to watch as well as among the most sensual styles of dance on the planet. Only you can decide for yourself if ballroom dance is something that might interest you. I do, however, encourage you to take stock of the various styles and themes before unilaterally deciding to rule out all ballroom dance as a possible interest. Under the International Style of ballroom dance there are two main categories of dance. They are Standard and Latin. The Standard style is typically hallmarked by Fred and Ginger sort of attire. By this I mean that the style of dress is very formal with men in coats with flowing tails and vests while the women wear very elegant gowns as part of their costumes. Latin dance is far more sensual in music, mood, and attire. Men wear tight fitting garments and women wear very little. Not only is the style of dance between Standard and Latin very different but also the styles of dance. 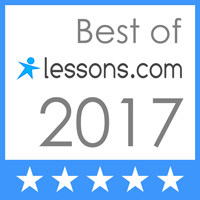 In Standard ballroom dancing you will find the following dances: the Quickstep, the Slow Foxtrot, the Tango, the Viennese Waltz, and the Waltz. The Tango for many is the highlight of the Standard event while others have a deep appreciation for the technical qualities of the many Standard dances of ballroom dancing. For the younger generation, the Latin portion of competitions is the eagerly anticipated event. The style of dance is very exotic and emotional as well as incredibly beautiful to watch. The mood this style of dance brings not only to the dancers but also to the audience is almost palpable. The fan favorites of Latin dance include the Cha Cha, Paso Doble, the Rumba, the Samba, and Jive dance. This form of dance is certainly in keeping with the idea that dance is quickly becoming a sport. The energy required for these dances is phenomenal as is the fitness level required in order to wear the costumes. The American standard when it comes to dance is a little different than the International Style. The two categories for American Style are Smooth and Rhythm. There are other differences as well. In International Style the couples are required to remain in a closed formation. For American Style ballroom dance these requirements are somewhat relaxed in order to allow for creative use of footwork. The step patterns for Latin or Rhythm dance are also slightly different than in the International Style of ballroom dancing though the sensuality of the music, costumes, and movements are very much the same. The smooth portion of the American Style of ballroom dance includes the Foxtrot, the Tango, the Viennese Waltz, and the Waltz. In American Style Ballroom dance the Rhythm portion of the dance includes the following: the Bolero, the Cha Cha, East Coast Swing, the Mambo, and the Rumba. The audience still enjoys the intensity of Latin dance and Latin influence though there are other influences as well. These are still a much anticipated audience favorite in most competitions. As you can see, ballroom dance has taken on a new intensity in recent years. 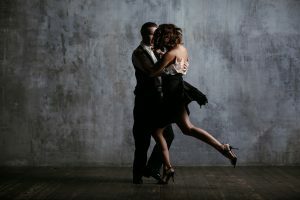 If you have preconceived ideas of what ballroom dance really is, it is time you saw for yourself how sensual this style of dance can really be.